Another film I have never seen. This being the first time seeing it was a treat. Specifically, being on this wonderful High Definition transfer to Blu-ray. Twilight Time has created another wonderful Blu-ray and another wonderful outlet to a forgotten film. This is a film that shockingly is good, considering it has never crossed my path before. I always try and see films starring some of my favorite actors. Liam Neeson and Bob Hoskins are both in this film. Two of my favorite performers in cinema. Also starring the wonderful, often underrated Mickey Rourke. This is a nice slick thriller. It’s about a former IRA member that is trying his hardest to hide or escape from his past. The film is based on one of my favorite writer’s, the book by the same name, the one of a kind action, spy guru of written word, Jack Higgins. Higgins creates wonderful action packed, mystery thriller’s that always please. Many of his books have been made into films. A Prayer for the Dying was brought to the screen and directed by a wonderful director of cinema. A director that I feel is often overlooked, Mike Hodges. Sadly, Hodges disagreed with the final cut of the film, and he felt it did not live up to what he intended it to be. There are rumors that there is an uncut version, or at least a longer version that portrays the ultimate want of the director. Hodges directed many films but a few of them ultimately stand out to me. First and foremost is the cult, drive-in late night classic, 1980’s Flash Gordon, the one of kind space opera. Truly a wild, funky, vibrant trip of colors and total b-movie glory. One of my all-time favorite guilty pleasures in cinema. Next would have to be the 1971 crime thriller classic Get Carter. Hodges has away with creating films that linger, or become a cult following style of films. Flash Gordon, Get Carter, and who can forget the odd ball science fiction comedy, 1985’s Morons from Outer Space. Whatever Hodges is doing, he captures his actors and actresses in tight moments that linger on screen, and A Prayer for the Dying is no different. The plot is, Martin Fallon played by Mikey Rourke and his IRA team member Liam Docherty played by Liam Neeson, make a huge mistake. That mistake would haunt Fallon who flees to London. There he is approached by a local gangster to do one last job, after this job they would give him money, a passport, and safe passage to the United States. Fallon is reluctant but decides to take the job, and so begins one ordeal after the other. Fallon is trapped by his haunting past, and the ordeal of the present, he struggles in what to do and in emotions. Intrigue, suspense, mystery all come together to create a great film to remember. As I have stated starring a wonderful cast of performers. Besides Liam, Hoskins and Rourke there are other powerful performers that grace this film. The amazing Alan Bates who is pure perfection in creating flawless characters. I can’t believe he is no longer with us, he was a master talent. Also starring the very underrated and often overlooked Christopher Fulford. Fulford is an actor that I think is a genius in performing. I think he is one of the greatest talents living today. He deserves all the praise. Looks and sounds fantastic. That is something Twilight Time never fails in, capturing a flawless transfer and vibrant sound quality. Imagery is perfect in high definition. A great Blu-ray to praise. Isolated Score Track (with some effects). The man behind the music is a genius. Composer and conductor William Bill Conti. A master at music. A master at memorable film scores. He is one of the best. All one has to do is look at his memorable career or catchy tunes, the Rocky soundtrack, need I say more. Also for the James Bond classic, For Your Eyes Only. The Karate Kid. He did the soundtrack to one of my favorite underrated films of all time the amazing 1993 crime drama Blood In Blood Out. Conti is a master at creating tunes and music that just remains with you all your life, I mean who doesn't know the Rocky soundtrack. After watching and hearing his music in the films, you remember them, hummm them and just know them. This is a great special feature. Twilight Time honored this master with this special feature. Director Mike Hodges on A Prayer for the Dying, a nice little interview with the director. 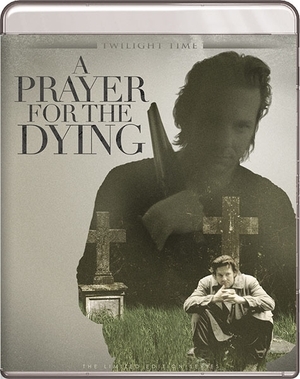 Director of Photography Mike Garfath on A Prayer for the Dying, s nice little interview with the photographer. I really liked this movie. Seeing it for the first time was a real treat. Seeing it on a flawless transfer and wonderful high definition Blu-ray is all the more to praise. A fantastic choice by Twilight Time. It’s a film that lingers and twists an emotional dilemma on past mistakes, choices and the reality of right and wrong. Final Verdict: In my viewpoint a must own. Another fantastic Twilight Time Blu-ray, and perfect choice.